As standard, ready made stretched canvases (i.e canvases whereby the canvas fabric is stretched over a wooden frame) are used. We usually use the highest quality 'Loxley Chunky' canvases with a depth of 4cm. Your canvas artwork will arrive, ready to hang, and Kerry always paints the sides of the canvas painting. The back is always signed and usually initialled on the front or side too, and comes complete with a signed Certificate of Authenticity! If you would like a canvas painting in a different size to the ones offered in the size options boxes on this website, this can be arranged. Please enquire. We should be able to arrange for one of our Bespoke, premium quality canvases to be made up especially for you in any size at all.. If you would like to arrange your own shipping arrangements or collection that is fine too.) Please get in touch to request quotations/discuss your requirements further. Should you require a canvas painting in a larger or non-standard size, or simply would like to invest in something extremely high quality and special, these Bespoke, premium quality canvases are of amazing quality! Price does work out to be a little more expensive, although they are well worth the extra money should budget allow! They comprise of a much sturdier and thicker, wooden frame and are stretched with thicker and higher quality canvas fabric, so overall your canvas artwork would appear of even higher quality. These canvases are also available in a choice of different thicknesses of 45mm or an even chunkier 70mm. If you are interested in ordering your artwork on one of these canvases, please get in touch with details for a quotation. If you would like your canvas artwork to be displayed in an outside area, simply purchase a standard canvas and let us know it will be displayed outside and we will treat the wood and enhance it with extra varnish so that your canvas painting can sustain the outdoor elements! We have tried and tested this method and it really works!! We will charge only an extra cost of only £10 to apply the additional treatments! Alternatively, we can arrange for a higher quality, Bespoke weatherproof canvas to be made up especially. 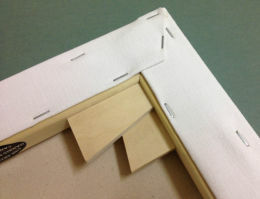 A harder wood can be used for the canvas frame, a weatherproof canvas fabric and also galvanised staples that will not rust. 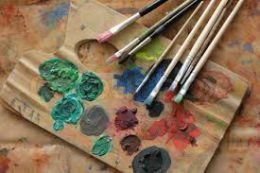 The pigments in the high quality acrylic paints we use do not fade over time and we coat our outdoor canvas paintings with extra varnish to ensure your canvas artwork can sustain the outdoor elements! Although these canvases are weatherproof we would still recommend that in extreme weathers and through the winter, they are protected. Choose from any of the designs in our collection in any size! Please contact us for a quotation! We understand you'll be anxious to receive your canvas artwork as soon as possible, so we will dispatch our 'made to order' canvas art, as soon as we possibly can. We are currently turning canvas artwork around to a timescale of approx 1-3 weeks, depending really on how textured the paint in the original art is - The thicker the texture on the canvas artwork, the longer the drying time really. However, should there be any urgency, please do get in touch and we will do all we can! 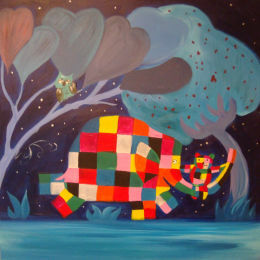 All our original canvas artwork is fully hand-painted. We do not use any digital methods at all in the process. We only use the highest quality acrylic paints (so that pigment will not fade over time) and/or other materials in our contemporary canvas paintings. After the paint has thoroughly dried, a thin layer of artists' varnish is applied for enhancement and protection! All our contemporary canvas art is original and signed with a full signature on the reverse. Sometimes they are also initialled on the front or side, unless the artwork could be hung anyway up. Please advise us if it is important to you that the artwork is initialled on the front. We specialise in textured, high quality, fully hand-painted original paintings and do not sell cheap canvas prints with no texture or depth! A lot of time, effort and care is put into each and every order. As all our canvas artwork is original canvas art and fully hand-painted, there may be some very slight variations to the canvases shown on this website. Nevertheless, they do not leave the artsit's studio unless they are looking 'right' and an extremely high standard! Should you require a photo of your actual canvas before dispatch, this can be arranged. Please let us know. Kerry is more than happy to take on commissions! If you do not see anything to suit in our collection here, please do get in touch with details of your requirements to discuss further. Secure payment is accepted through this website via Paypal. If you do not have a Paypal account, you can still pay by credit or debit card using this service. If, however, you would prefer to pay by bank transfer, cheque or cash on collection this can also be arranged. In the unlikely event that you are not 100% satisfied with your canvas artwork, no quibble returns are accepted within 14 days. Please get in touch to let us know you would like to return. (We regret that cannot always cover return shipping costs.) 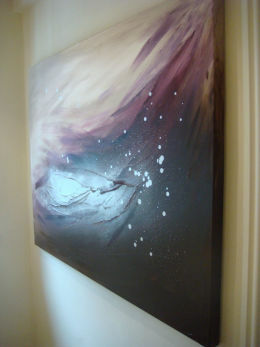 We are happy to arrange for the couriers we use (DX Freight) to return the canvas artwork back to us for a fee of £20. You would be offered an exchange or your money back. We can assure you that when we handle your order, we do this in line with the General Data Protection Regulation. We only ask for the information we need to process your order and ensure it is dispatched to the correct address etc. A record of the sale is kept safe and secure for auditing and accounts information only. We do not use or share your information with any other organisation or third party.